Your donation to GRACE will help us expand our programs and educate more people affected by cancer. Donate to GRACE with workplace giving, planned giving, and shopping for the cause – or come up with your own fundraiser. GRACE provides expert-mediated information on current and emerging cancer management options in order to empower patients, caregivers, and health professionals to become direct partners in cancer care. Your donation to GRACE helps us to continue our patient education resources and programs. Thank you for your commitment to support GRACE in continuing to make a difference in the lives of cancer patients. 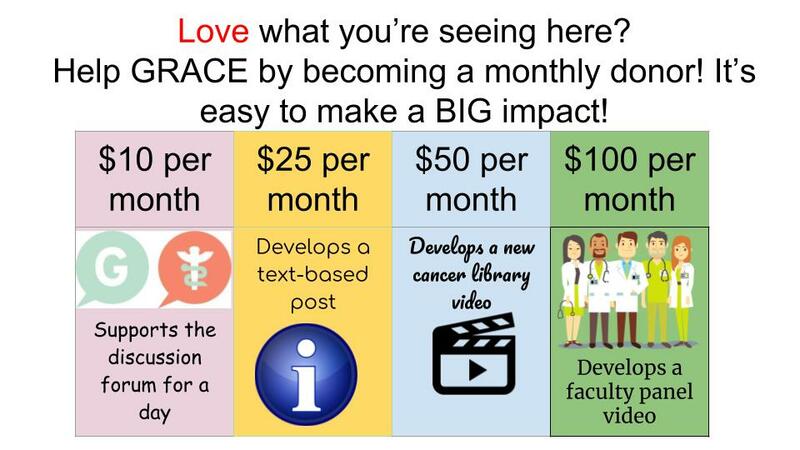 The Global Resource for Advancing Cancer Education (GRACE) is a nonprofit organization that has been granted tax-exempt status from the IRS under section 501(c)(3) of the US tax code. Donations are tax deductible according to current tax law for 501(c)(3) organizations. Our Tax ID is 56-2676328.